Elle Sees|| Beauty Blogger in Atlanta: Influenster Rose VoxBox! Have you heard of Influenster? It's a free review company where occasionally you receive free products, depending on how active you are on the site. I was selected to review their Rose VoxBox. I waited a month and never received it, so they sent me another one, and here I am to share it with you. 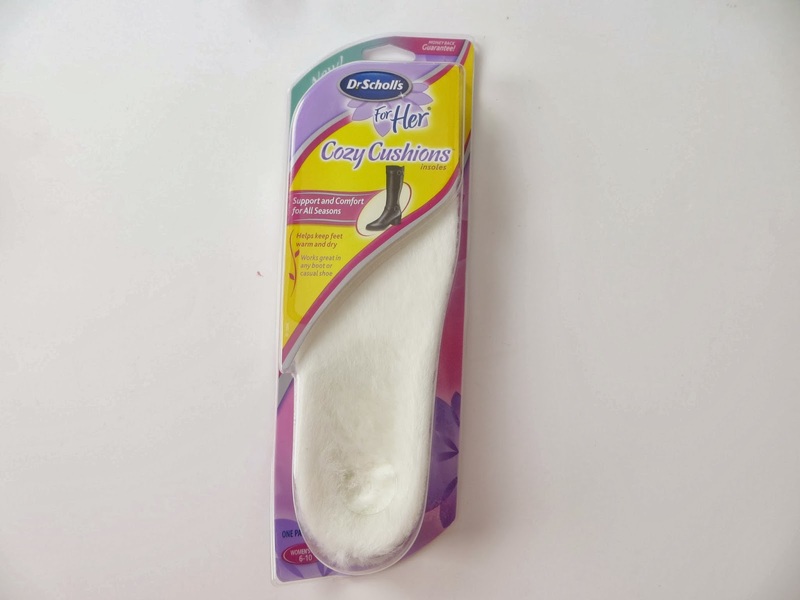 First up are the Dr. Scholl's For Her Cozy Cushions--These are soft, fuzzy cushions that are perfect for boots. I liked them in my boots. And now for some tasty treats! First is the Lindt Lindor milk chocolate truffles. This was my fave item, I gotta say. 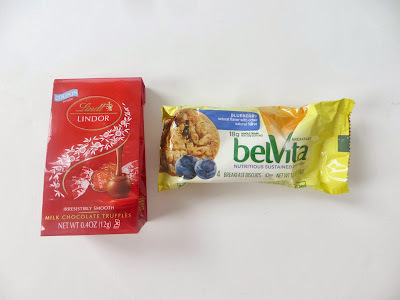 The Belvita bar is blueberry was a delicious breakfast treat. It was kind of like an oatmeal blueberry bar compressed into a crumbly hardened one. There were some beauty items, too! Rimmel ScandalEyes Retro Glam features an hour glass wand. Normally I don't like these, but I was pleased with the results. The formula was neither too wet or dry and gave me nice lashes. I don't think it's THE best mascara, but I would purchase it. 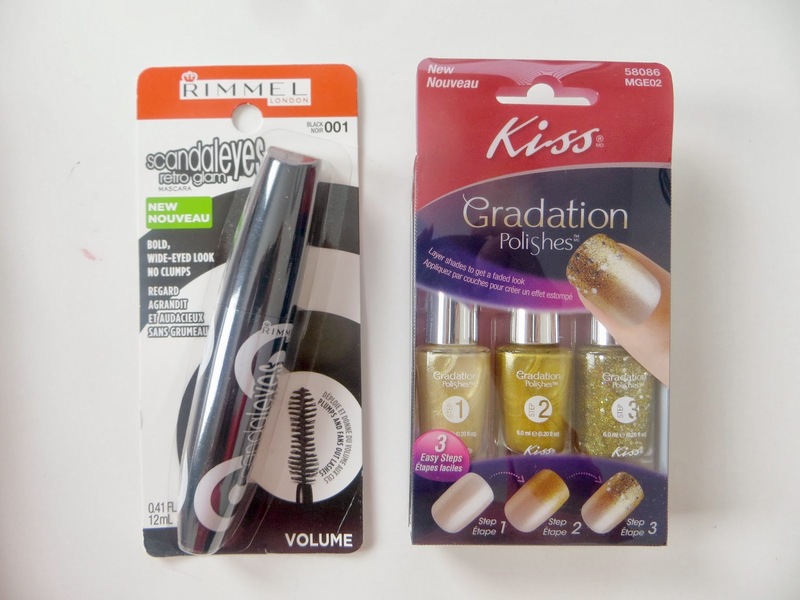 Kiss Gradation Polishes features 3 polishes and directions to give that ombre effect. I liked the gold polishes, which are perfect for the holidays. The smell though is really strong. I wore this polish twice, but liked the results better when I used a dampened makeup sponge instead of the brushes. Overall, I was pleased with the products I received in my Influenster Rose Vox Box! I find myself not to be a big kiss fan. Oh yes I have some shoe inserts. The ones I have included mild arch support. They do make my boots more comfortable. I'm with you on hourglass wands... they drive me nuts!! Influenster sounds cool, I'm signing up for it! Those treats look delicious!! I like the idea of getting a set of nail polish that creates an ombre look! Very fun! I love Rimmel Scandaleyes because they make my eyes look really pretty :) And those shoe cushions are such a must have here in northern Europe where it gets super cold! They're not just comfortable, they're also really warm! lindor is my fav too! Oooh, the cozy cushions sound great! I have some flat boots that get really uncomfortable after a few hours, and those would be perfect.